Step 1 : pick 3 colors one for the base and two contrasting colors. Step 2 : Paint each nail with the polish of your choice. Add a good top coat and allow your nails to dry completely. Step 3 : .Pour 1 drop of polish on a paper plate. 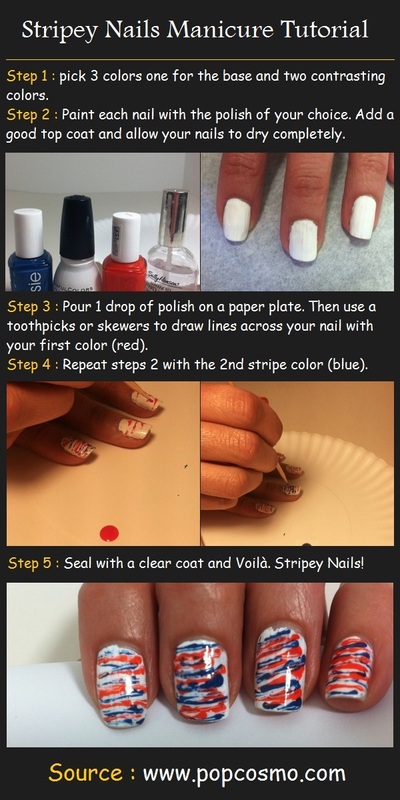 Then use a toothpicks or skewers to draw lines across your nail with your first color (red). Step 4 : Repeat steps 2 with the 2nd stripe color (blue). Step 5 : Seal with a clear coat and Voilà. Stripey Nails!